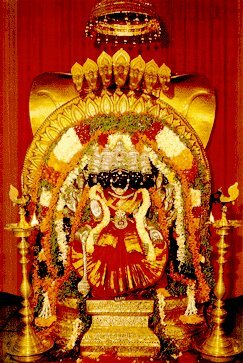 This temple of Goddess Sri Gayathri is built by Sri Chidambara Dixith with the support of many Devotees. The inspiration to build a temple came from his divine blessing from the goddess Sri Gayathri Devi. This temple was built in 1962 by the divine grace of Godess Sri Gayathri Devi. In 1977 the idol of Lord Anjaneya was installed inside the temple complex, in 1986 Idols of Lord Ganesha along with Siddhi Buddhi and Lord Shanmukha were also installed, in 1990 the idols of Lord Shiva and Parvathi along with the Navagraha Deities were installed. Of lately the Idol of Lord Vishnu is also installed inside the temple complex.